Thank you again, Ruth, for giving us this reason to celebrate each Saturday. 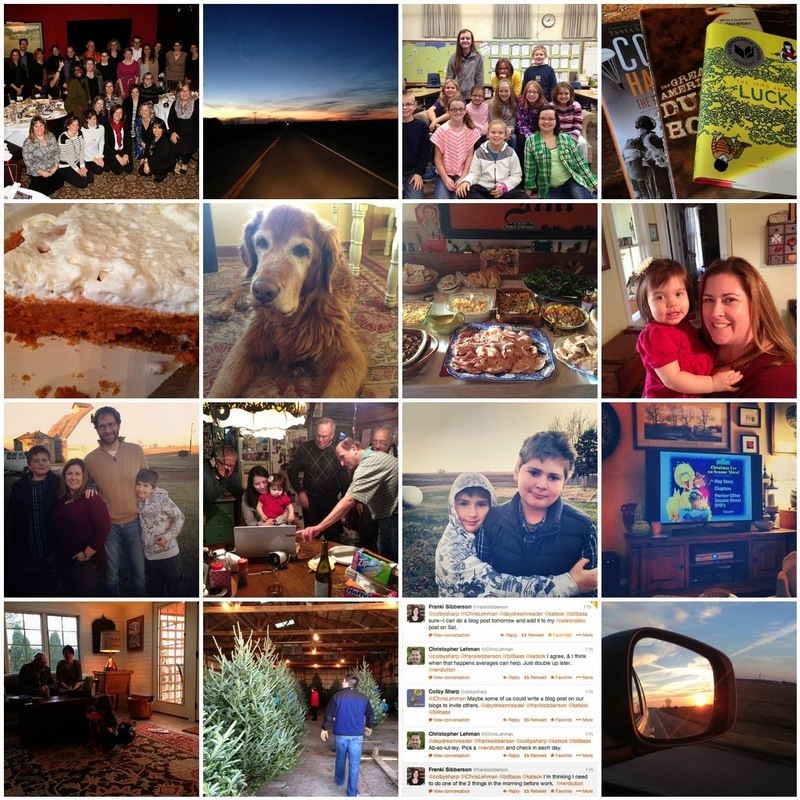 Check out Ruth’s blog for a link-up of all of the Saturday celebrations this week. This week my brain is a little fuzzy, my belly a little full. I decided to create a picture mosaic of what I am celebrating and just write a sentence or two for each picture. 1. Friendship - Amazing NCTE friends. This is just one photo, from one night. It seems unbelievable to me that I was just there last week. NCTE inspires me each and every year. 3. Students - How can you not celebrate these faces? My students rock and I was thrilled to get to spend two days with them before Thanksgiving break. 4. #Bookaday – I always celebrate time off and try to read a book a day. As of today, I’m almost done with my sixth book of our five day break. 5. Mom -My mom stayed home from Thanksgiving this year to rest. I’m grateful that she is out of the hospital, though, and that she gave me her pie recipe to make. I’m also grateful it turned out ok. I was extremely stressed. 6. Bally - I will celebrate every day that Bally is still with us. 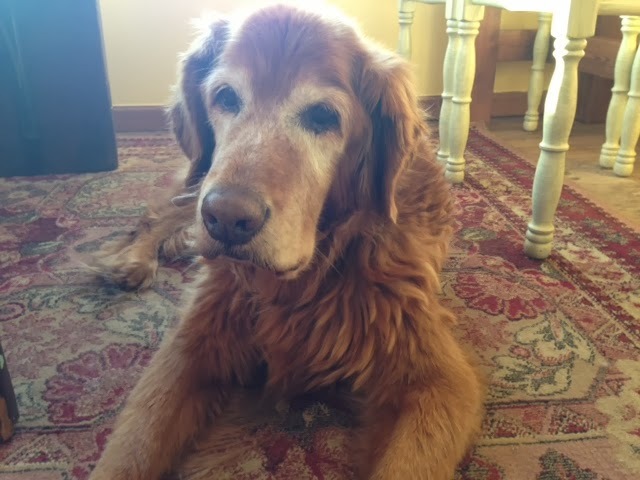 I am hoping she is still here for Christmas, but am also celebrating her long life. 7. Thanksgiving is a celebration itself. 8. Love my niece – and that I got to spend time with her AND my niece Meredith. 9. My family. I will celebrate a few year(s) from now when I am the shortest member. 10. SKYPE – love connecting to family members far away. Technology is amazing. 11. Sons - I celebrate these two every day. 12. Traditions – Christmas Eve on Sesame Street and Cream of Broccolli soup every year on Thanksgiving night. 13. Generations - My 89 year old great uncle. Love him. 14. Christmas Tree – shopping for it with my brother and my dad. It’s like I was ten again. 16. Sunsets – I celebrate a good sunrise or sunset every single time. I’m grateful for every day I have. Last night my Twitter notifications were going crazy. 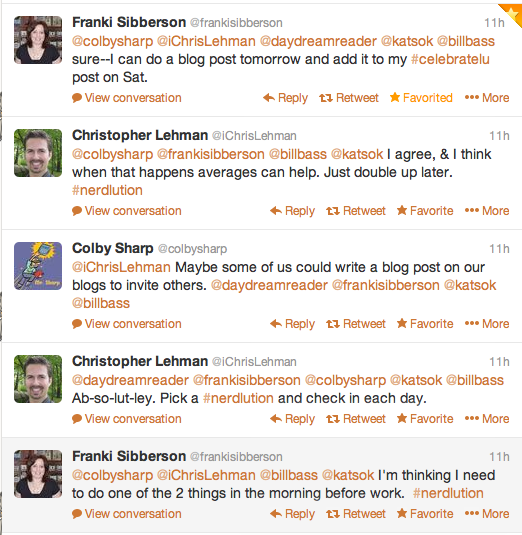 I had stumbled into a conversation with Franki Sibberson and Colby Sharp about Colby’s resolve to write daily. When Franki mentioned she needed to begin running again, I said I’d join her – but I would be walking. More friends joined in and we ended up with a hashtag - #nerdlution. #nerdlution is what you make of it. We’re setting goals for the next fifty days – Monday the 2nd through January 20th. My goal is to find time to write and walk each day. I have a dream of writing a book, but can’t see my way into it yet. Ideas swirl in my mind, but nothing is taking hold. I am hoping if I can commit to writing each day towards a book, something will pour fourth. Walking is just a habit I need to return to. I love the idea of joining with Twitter friends in this challenge. Colby is writing daily. Franki is writing with Bill daily and running as well. Chris is working on push-ups. More and more friends joined in as we talked. How about you? Is there a goal you want to put forth? Join us for the next fifty days. Tweet your progress daily using the hashtag #nerdlution. Hope to see you there. Where the character was giving thanks. Only with the items you had given thanks for today. As I result, I give thanks. But I am blessed beyond measure. Colleagues – both near and far. Authors that inspire my students. As are many of the people I care about. To help the others get back to health too. Mostly I am thankful for my spirit. To be born with one looking for gratitude. Or maybe that I evolved to this place. The sunrise today moved me to tears. Who I thought would be gone months ago. Education is such a funny profession. Most teachers I know work harder than they should, make less money than they dreamed, spend more on their classroom, sleep little, yet dream big. Teachers usually teach because they want the best for children. It is something you feel called to do – otherwise who in their right mind would ever go into this job? I am blessed beyond measure. I teach in a district that has not told me how I must teach. I am not forced to use a curriculum I don’t believe in. I do zero days of test prep in my classroom – and my administration is fine with that. I have children who love me, parents who support me, and colleagues who make me smile. That being said, even I feel the change. Education is under attack. Teachers are under attack. When I scan education blogs, articles, and tweets I wonder when local and state governments lost all control of education. I wonder when people who have never been in the classroom became the experts on what should go on in said classrooms. When I read the standards for kindergartners, I wonder if those same people have ever met a five year old. Questions swirl in my mind. Despair fills my heart. And then, I breathe. While I would love to “fix” education, I know that is beyond my reach. I can change what is close to me. I can choose the attitude I enter my school and my classroom with each day. In my own small way, that is changing education. Chris Lehman shares what his butter knife is – connecting. Mine is similar. Relationships. Love. I have said it before and I can say it again – if relationships and love don’t come first in the classroom, nothing else will work. Your students won’t grow without it. Monday morning I entered my classroom laden down with bagels and a toaster to have breakfast with a small group of students and discuss Newbery contenders. I’ll be honest, I was questioning why I scheduled this meeting on the day after I returned from NCTE. I was a vision of exhaustion – bags under my eyes, my hair a mess, disheveled, dragging. A colleague stopped by my room to ask how it went and we were quickly interrupted but fifth graders flowing in for our breakfast. Shouts of, “You’re back!” and “We missed you so much!” came at me. I had tears in my eyes as I received hug after hug. We discussed books, ate bagels, and breakfast quickly passed. I readied myself for a day of teaching, buoyed by the breakfast with my small group, but still felt exhaustion returning. My class flooded into the room. More joyous shouts came at me, hugs, high fives, and then a quiet hug with a whisper, “I just love you so.” I hugged back and then walked out in the hall to compose myself. This is my butter knife. These connections. These relationships. In the face of ugliness in education, I instead think of these faces. I love them so much and can’t wait to see them again in five days. They are the reason I teach.